‘One of the great turning points in 20th-century American history was the Supreme Court’s 1954 Brown v. Board of Education decision, which overturned on constitutional grounds the 19th-century Plessy v. Ferguson case that had upheld legal segregation. This decision was the starting point for the civil rights movement, which, over the following decade, succeeded in dismantling the formal barriers to racial equality and guaranteed the rights of African Americans and other minorities. The courts had cut their teeth earlier over union organizing rights; new social rules based on those rights provided a model for subsequent social movements in the late 20th century, from environmental protection to women’s rights to consumer safety to gay marriage. The genesis for Conservatism’s Myth of Usurpation of The Old Order , here presented in the abstruse rhetorical frame of ‘Institutional Decay’: the end of Segregation in public education, and it’s corollary of oppression, Jim Crow, proceeds from the unanimous Brown v Board. The Civil Rights movement in it’s most militant phase grew out of this landmark decision. It is the beginning of the politics of the present, the genesis of The Federalist Society, and the judicial careers of Rehnquist,Scalia, Thomas, Alito inextricably linked to Neo-Confederate/Originalism as legal cover, the Nixon Southern Strategy, and of the contemporary blight of Republican Nihilism. The proof is the legal restrictions placed on voting in 26 states controlled by Republican governors and legislatures ,since the election of President Obama. And the legal obscenity of the Robert’s majority decision in Shelby County v. Holder. It’s overarching but utterly disingenuous rhetorical/legal claim: ‘things have changed’. Read Justice Ginsburg’s devastating polemical dissent, it is based not on bogus claims, but on the presentation of empirical evidence. 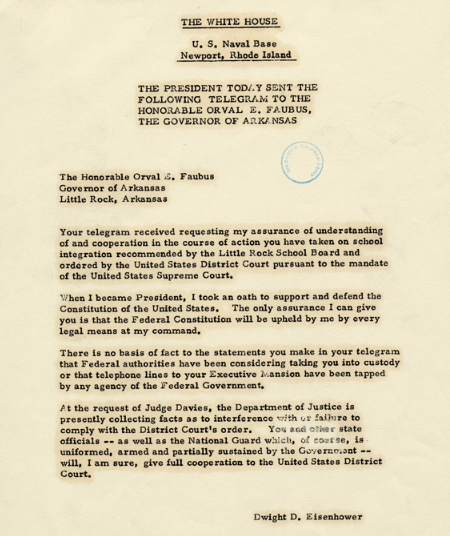 President Eisenhower’s letter may prove Mr. Fukuyama’s claims to be true, according to his presented arguments, as unconvincing as they may be. Yet the cult of the Law was once a cornerstone of ‘Conservatism’, or perhaps it was law based on an entrenched, indeed institutionalized ,racial hierarchy. In this portion of Mr. Fukuyama’s essay, an unconvincing attempt to re-frame Brown as a product of ‘institutional decay’, rather that of a civic/legal/institutional vibrancy, takes it’s place as a politically complicated set of arguments: a highly intellectualized and rationalized propaganda. Reblogged this on StephenKMackSD's Blog.